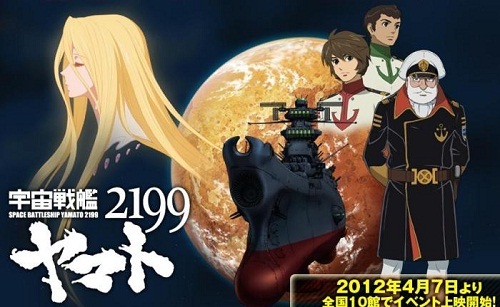 I’ve just finished watching the first three episodes of Space Battleship Yamato 2199. It’s quite surprising so far. 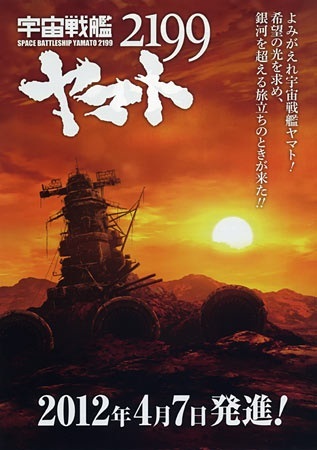 The war guilt motif of the original series is still present as seen in the Yamato’s first firing of the Wave Motion Gun. After that battle at Saturn, Captain Okita muses on possessing the power to destroy the universe. It’s a bit dramatic, but it’s a fascinating reaction to the once powerless and victimized Earth now possessing a multi-use weapon of unprecedented mass destruction. The writers have also installed something of a discernible command/rank structure to the Yamato’s crew. Doing so probably doesn’t mean much to the casual viewer, but I always long to learn the fussy little details of my science fiction. Though if Sanada is officially Captain Okita’s executive officer, then I’m not quite sure how Kodai is going to get moved up to acting captain when Okita’s radiation sickness leaves him unable to command the ship. Are they going to kill Sanada to make room for Kodai? Of course, such a notion presumes Kodai, who has already been considerably up-jumped from Third Lieutenant to something in the neighborhood of a Lt. Commander, is destined to skipper the Yamato. On a related note, Yamato 2199 is being very flagrant in its decision to ostensibly broaden the cultural context of the Yamato’s mission. Where world government was implied in the original series, Yamato 2199 sees the United Nations taking a front and center role as stewards of the Earth. In theory, it’s no longer a show about Japan as the spear which will save the world. Now the Yamato and her crew are agents of the United Nations Cosmo Navy. Of course, all of the historically relevant Japanese nomenclature remains intact within the Yamato’s crew. Further, the named ships of Humanity’s last organized stand against Gamilas are all drawn from Japanese naval history: the Kirishima, a Japanese battleship which served from 1915 to 1942; the Murasame, a Japanese destroyer which served from 1935 to 1943; and the Yukikaze, a Japanese destroyer which became the stuff of naval folk legend as one of only two pre-war IJN destroyers to survive the war. This paired with the grand historical irony of using the IJN Yamato as a means of saving the Earth, when its construction was the product of slave labour in the wake of the Sino-Japanese war, manages to keep the focus on Japan despite the crew’s UNCF uniforms. Nope, nothing at all Nazi like about this...move along. 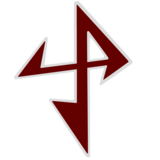 Finally, all of the (anti) Germanic motifs to Earth’s antagonists, the humanonid aliens known as Gamilas, remain in play. Speaking officers within the Gamilas navy, such as Commander Schultz and Officer Ganz, have outright German names. While the Yamato may have its Wave Motion Gun, Gamilas makes ready use of atomic weapons and radiation bombs to attack the Earth. Even the semiotics of Gamilas betrays at least a passing connection to the Third Reich. It remains fascinating to see the complex nature of Japan’s post-war psychology, as well as its place in history, present within this fresh take on the Yamato story. At this point in the series, however, I’m led to one question in particular: is historical revision at the core of Space Battleship Yamato? Could we remove all of this counter-factual subtext and still be left with something familiar to the audience?